Daily Illuminator: The Stars Have Never Been More Right For #PlayMunchkin Cthulhu Game Day! April 13, 2017: The Stars Have Never Been More Right For #PlayMunchkin Cthulhu Game Day! Munchkin Cthulhu has kept players laughing at over-the-top Lovecraftian backstabbing and insane ichor combinations for just over 10 years! Retailers, join us as we celebrate Munchkin Cthulhu's anniversary! Over the entire weekend of May 13th, retail stores are invited to open their doors to amateur Investigators and Monster Whackers in search of ultimate reward by hosting a #PlayMunchkin Cthulhu Game Day. 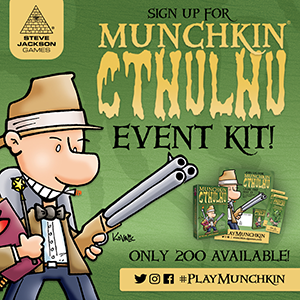 We're hosting sign-ups for the #PlayMunchkin Cthulhu Event Kit right now. Store owners and managers can sign up to receive this collection of Elder God goodies. It includes a new face on an old bookmark, insanity-causing cards, and a demo copy of Munchkin Cthulhu, which you can use to add more munchkin-ly Cultists to your neighborhood. So, fellow tentacle-lovers, get your friendly local game store to invite in the insanity and prepare for the glorious end times with you!